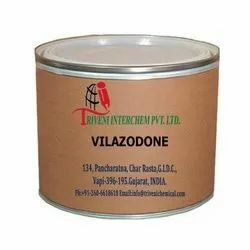 Manufacturer of a wide range of products which include vilazodone and levomilnacipran hydrochloride. Vilazodone (163521-12-8) is solid. it is use in anti depression, selective serotonin reuptake inhibitor, neurotransmitters and serotonin Industry.Vilazodone (163521-12-8) is solid. it is use in anti depression, selective serotonin reuptake inhibitor, neurotransmitters and serotonin Industry. Levomilnacipran hydrochloride (175131-60-9) is powder. it is also known as Levomilnacipran hcl, milnacipran hydrochloride and milnacipran hcl. it is use in Antidepression, serotonin and norepinephrine and depressive disorder Industry. Storage: Keep container tightly closed. Keep container in a cool, well-ventilated area. Looking for Anti Depression API ?